Description: Attractive county map of Westmoreland using early geography presented by Christopher Saxton in the very first county atlas titled "Atlas of the Counties of England and Wales" published 1579. Coloured. Description: Fine Dutch Golden Age county map of Westmoreland with decorative cartouche, coats of arm. German text on verso. Coloured. Description: Westmoreland. Stunning county map with inset of Kendal and various heraldic shields. Coloured. Description: Early miniature copper-engraved map of Westmoreland. Coloured. Description: Pleasant copper-engraved map of Westmoreland showing the county hundreds and major towns and cities. Elegantly engraved topography and later hand colour. Description: Beautiful county map or Westmoreland, detailing Shap, Kendall, Appleby, Keswick, part of The Lake District over towards Durham and Yorkshire. From the Antiquities Edition, presented with iIllustrations of stone artefacts. Outline colour. Description: Miniature copper-engraved map of Westmoreland highlighting the main towns of Kendal, Appleby, Ambleside, Orton and Shap and showing Ullswater and Windermere. Coloured. Description: Fine copper-engraved map of Westmoreland highlighting the major towns of Kendal, Penrith, Ambleside and Appleby and showing Windermere and Ullswater (now part of the Lake District National Park). Coloured. Description: Westmoreland. Miniature county map. Coloured. Description: Attractive map of Westmorland now part of Cumbria, highlighting the developing road network during the Industrial Revolution. Original hand colour. 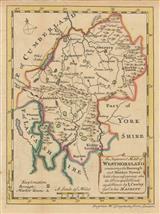 Description: Westmoreland, a detailed and attractive county map published in the early 19th Century. Original colour. 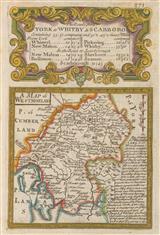 Description: Magnificent Georgian folding wall map of Wesmoreland on two sheets.